This free email client is intuitive to use, easy to customize, and available on many operating systems. Maybe you can relate to this story: You try out a program and really love it. Over the years, new programs are developed that can do the same things and more, maybe even better. You try them out, and they are great too—but you keep coming back to the first program. That is the story of my relationship with Alpine Mail. So I decided to write a little article praising my de facto favorite mail program. In the mid-90's, I discovered the GNU/Linux operating system. Because I had never seen a Unix-like system before, I read a lot of documentation and books and tried a lot of programs to find my way through this fascinating OS. 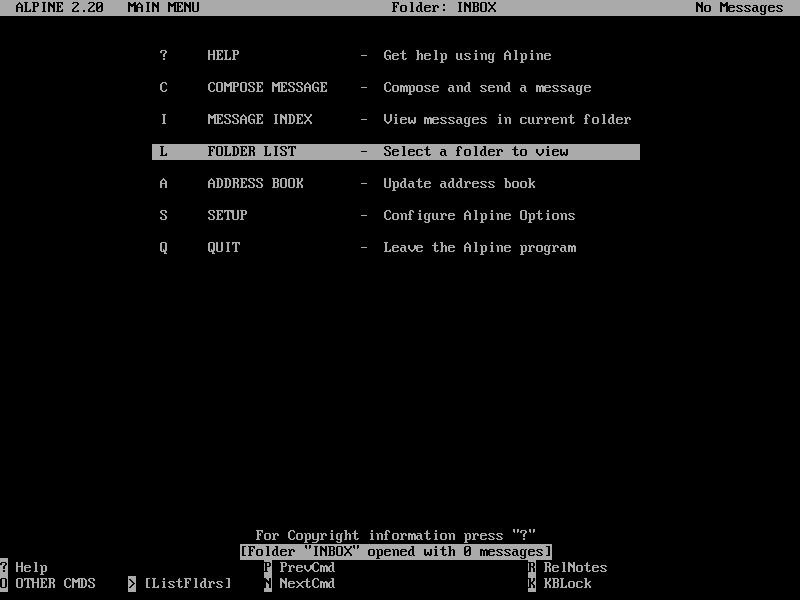 After a while, Pine became my favorite mail client, followed by its successor, Alpine. I found it intuitive and easy to use—you can always see the possible commands or options at the bottom, so navigation is easy to learn quickly, and Alpine comes with very good help. Most distributions include Alpine. It can be installed via the package manager: Just press S (or navigate the bar to the setup line) and you will be directed to the categories you can configure. At the bottom, you can use the shortcut keys for commands you can do right away. For commands that don’t fit in there, press O (Other Commands). Alpine will ask you if "Inbox" should be used (yes) and put curly brackets around the server part. When you're done, press E (Exit Setup) and commit your changes by pressing Y (yes). Back in the main menu, you can then move to the folder list and the Inbox to see if you have mail (you will be prompted for your password). You can now navigate using > and <. To compose an email, simply navigate to the corresponding menu entry and write. Note that the options at the bottom change depending on the line you are on. ^T (Ctrl + T) can stand for To Addressbook or To Files. To attach files, just navigate to Attchmt: and press either Ctrl + T to go to a file browser, or Ctrl + J to enter a path. Send the mail with ^X. Of course, every user's personal preferences and needs are different. If you need a more "office-like" solution, an app like Evolution or Thunderbird might be a better choice. But for me, Alpine (and Pine) are dinosaurs in the software world. You can manage your mail in a comfortable way—no more and no less. It is available for many operating systems (even Termux for Android). And because the configuration is stored in a plain text file (.pinerc), you can simply copy it to a device and it works. Heiko Ossowski - I started my Linux adventure on an Atari Falcon 030 with Watchtower and Debian. Now I'm a Administrator in the Linux and Windows world. I remember liking Pine and Alpine, but struggling a bit with getting folder structure shown and getting Unicode to work. I could have written this article as well. I gravitated toward Pine rather than Elm or Mutt because it was more straightforward, and eventually switched to Alpine. I think I've kept the same configuration for the last 20+ years. I thought I was alone in liking my rather basic email client. That makes me scared to use Pine... I like it... But struggle remembering commands to save to folders etc. And its weird when you move emails to folders you have to hit D and X to delete the emails from the folder.. I guess " moving " emails to a folder only COPIES the email to a folder and doesn't psychically move the email like a normal email client would? Thanks for the termux tip! I also love Alpine and now I can run it in Android. Do you know if alpine > 2.20 or pine will support TLS 1.2 ? 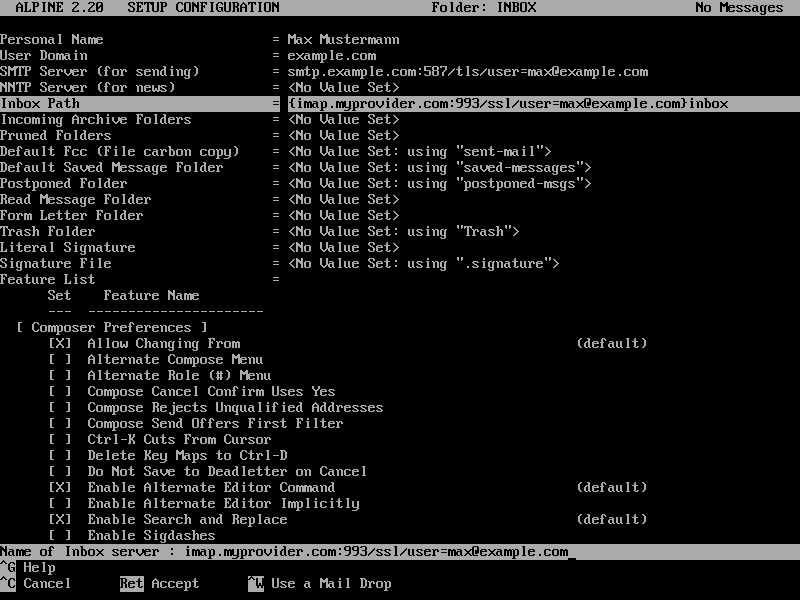 You should try Mutt, the email client, it's got colors! and text-based interface. Nice article, I like Alpine and Mutt, both work nicely with my gmail. Thanks for sharing. Anyone know if Alpine 2.20 > or Pine supports TLS 1.2 ?? I just started using alpine tonight.. Just by reading this article :) .. I don't even know how I found this article lol to be honest. 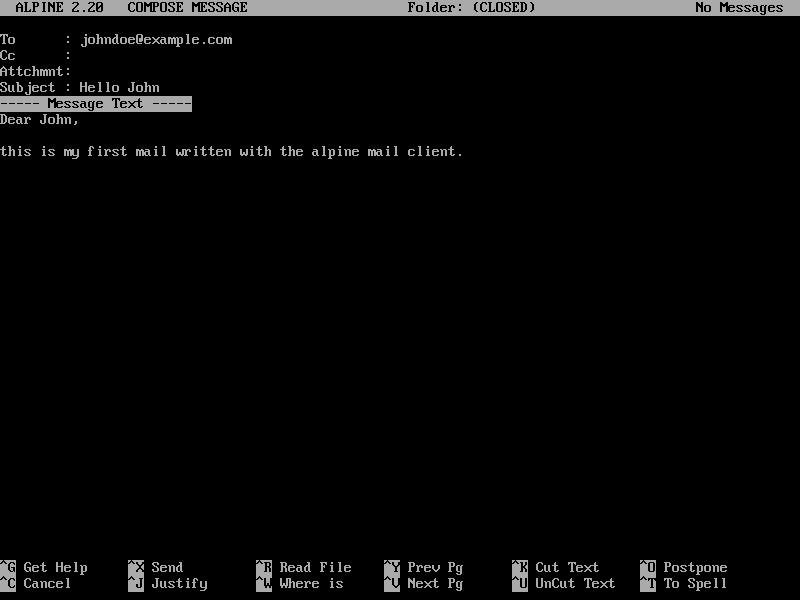 Its a pretty nice email client..